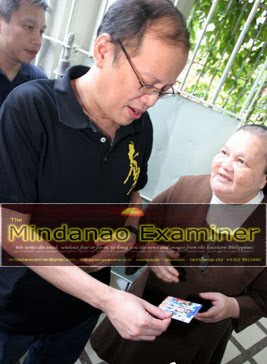 SULU, Philippines (Mindanao Examiner / Feb. 11, 2011) – Filipino leader Benigno Aquino III flew Friday to flood-ravaged southern Philippine town of Jolo where he distributed relief goods to thousands of victims. Sulu Governor Sakur Tan welcomed Aquino and briefed him about the government rehabilitation efforts in the capital town of Jolo, the worst hit by flash flood last week that left 6 people dead, including a child. More than 4,000 people were displaced by the flood and over 160 other injured. Tan has asked Aquino some 5,000 bags of rice and P20 million worth of financial assistance for additional rehabilitation efforts in Sulu, one of five provinces under the Muslim autonomous region. He said they need more equipment to remove garbage that is clogging waterways in Jolo. Aquino also said he would ask the Manila Waterworks and Sewerage System to urge the two water concessionaires of Metro Manila to help or assist in desalinating the murky water of the province to ensure that flood victims can continue enjoying potable water. He ordered the Department of Social Welfare and Development to coordinate with the National Food Authority for the rice supplies to flood victims. The Philippine News Agency also reported that the President would send scientific experts to Sulu to undertake studies and recommend long-term solutions on how to mitigate flooding and other disasters in the future. Jolo Mayor Hussin Amin has asked Aquino for the reconstruction of damaged roads in the town. The President said he would ask Public Works and Highways Secretary Rogelio Singson to study how to respond to this request in as much as Sulu is part of Muslim autonomous region. Local officials have previously criticized the Muslim autonomous regional government for its long failure to bring development and infrastructure projects in Sulu province. They also blamed the regional government for its failure to put up a drainage system in Jolo that resulted to deadly flooding in the town. Aquino had been told that the budget given directly to the Muslim autonomous region under Governor Ansaruddin Adiong, a close political ally of former President Gloria Arroyo, is at P12 billion a year and “yet many officials here complain they get nothing in the form of support or services. Where are the funds going then?” he asked. He said he asked government auditors to look into the books of Muslim autonomous regional government and they found at least P1 billion in questionable transactions. Aquino has also ordered additional beneficiaries for the government’s Pantawid Pamilyang Pilipino Program allocation for Sulu. The program is a poverty reduction strategy that provides grants to extremely poor households to improve their health, nutrition and education particularly of children aged 0-14. It is patterned after the successful Conditional Cash Transfer Programs in Latin America and Africa.